Bay Area Denture is one of Corpus Christi’s fastest growing denture and dental practices. In 2013, the former owner, Dr. Victor Firmani asked East Meets West Productions to locate a buyer for the practice, negotiate the sale, and provide financing. The practice, while managed by Dr. & Mrs. Firmani faced many challenges with their patients; numerous patient complaints to the practice, online negative reviews, and negative features on KZTV’s Trouble Shooter news program. EMW was asked to reintroduce the practice and navigate the challenges presented. EMW located a potential buyer, Dr. Dennis Van Maren, DDS who joined the practice as an Associate Dentist. As the agent of record for the practice for the past 7 years, we discussed the issues affecting the brand and presented solutions to Dr. Van Maren during his employ as an Associate. In order to reposition the practice as a provider of denture and dental services, we first had to redesign the logo with a similar look and feel to retain top of mind awareness in the marketplace, yet communicate a change in ownership and philosophy. 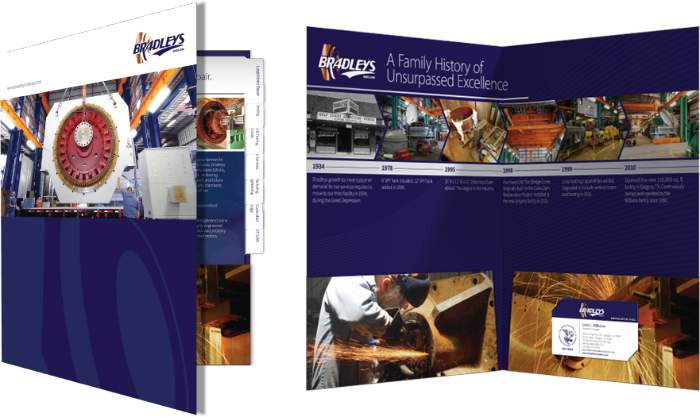 New marketing materials, a new website, new TV commercials, and a robust public relations campaign were all employed. We conducted meetings with existing team members in order to showcase the intrinsic value of the practice’s services and developed an employee handbook along with new training materials to ensure employees were compassionate and cognizant of patient concerns and complaints. To remedy the practice's negative reputation, EMW redesigned advertising to showcase Dr. Van Maren as the new owner and focused on his qualifications as a retired United States Air Force Colonel, with many years of experience as a military dentist and Administrator of Air Force medical facilities. EMW also published advertising in the local daily newspaper at its expense to relay the sale of the practice from Dr. Firmani to Dr. Van Maren. 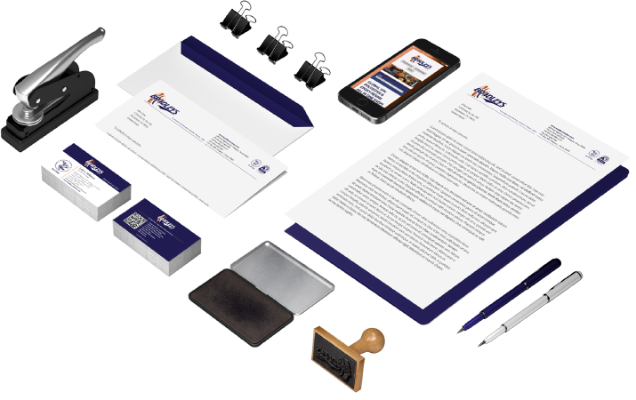 As part of EMW's rebranding efforts, a new corporate brochure as well as denture and method comparison sheets were created that aided the practice’s sales team, giving them tools to use when inbound cold calls turned into real-live leads looking for more information. EMW’s first task was to redesign the practice's website with a mobile-first approach, thus improving Google search engine rankings. The new website, promoting the company's new ownership and rebrand, provides potential patients with valuable educational resources on dental health as well as detailed dental procedure after-care instructions. Interactive new-patient information forms, Better Business Bureau ratings and financing programs were all enhanced. 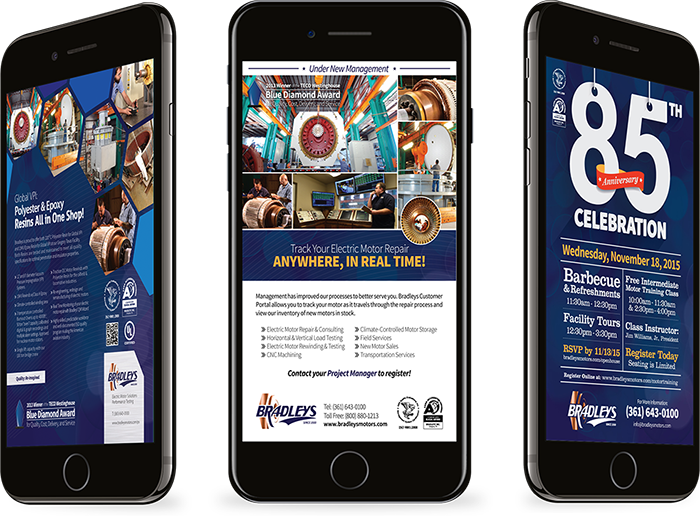 Our next task was to put Bay Area Denture’s new ownership and enhanced services message in the inboxes of their patients and potential patients. Our focus is on building a monthly digital marketing campaign to drive visitors to KRISTV.com and KIIITV.com back to the practice’s website where new and updated information on dental care is readily available. We’re proud to say that site traffic has reached record numbers since we began working with Dr. Van Maren. 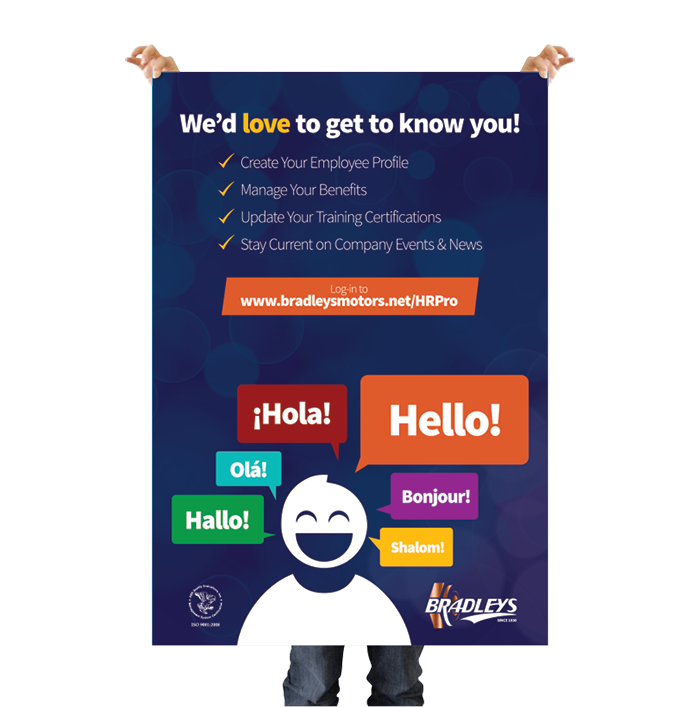 As part of our offline efforts, we created a presentation the Bradleys sales team could use every day, giving their sales team a tool to use when cold calls turned into real-live leads looking for more information. We worked hand-in-hand with their management team, creating a piece that was simple, to the point, but still very informative. 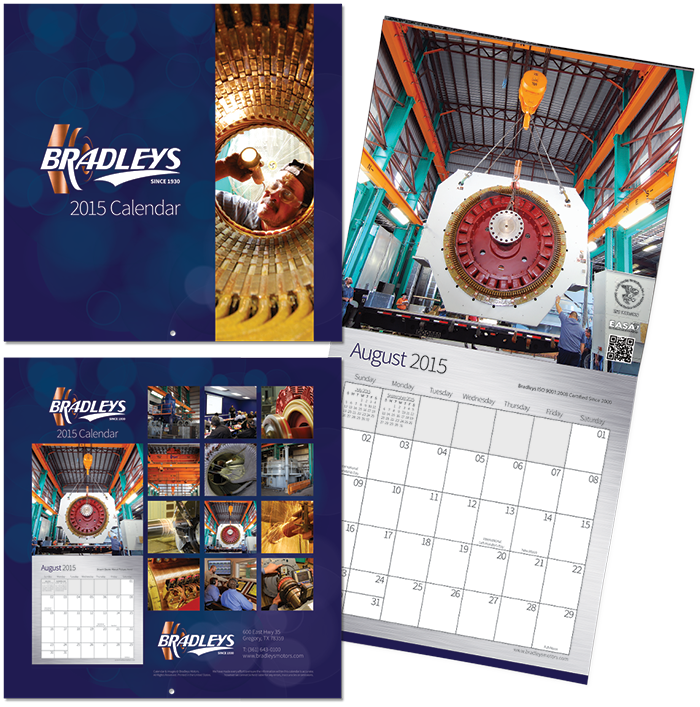 Unveiling the “new” Bradleys and its brand required much more than advertising and sales team presentation to existing clients. In the past, the company exhibited in one trade show; one in which the only attendees were their competitors. 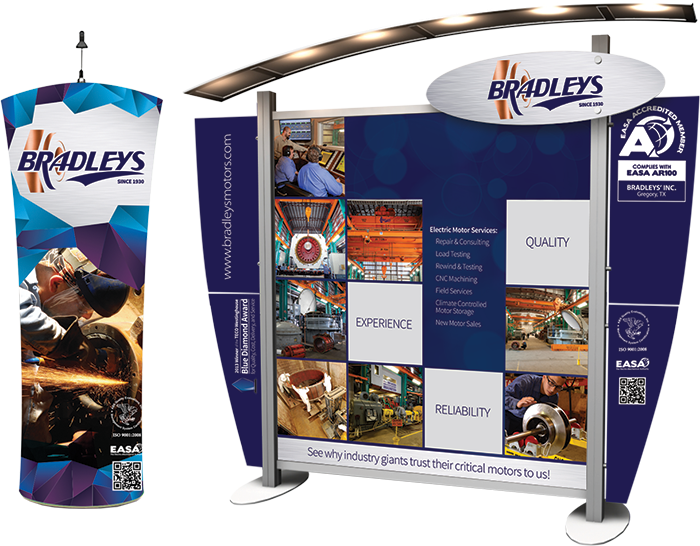 By learning Bradleys’ expertise in providing critical services and the impact on potential customers, EMW defined a short list of trade shows to generate new revenue streams. We then designed a state of the art trade show booth with associated marketing materials and specialty “giveaway” items to drive new business and compile new lead lists for online and offline marketing contact. In addition to core, traditional marketing, EMW implemented marketing tactics aimed at social media like Linked In, message boards, and editorial features in trade magazines. 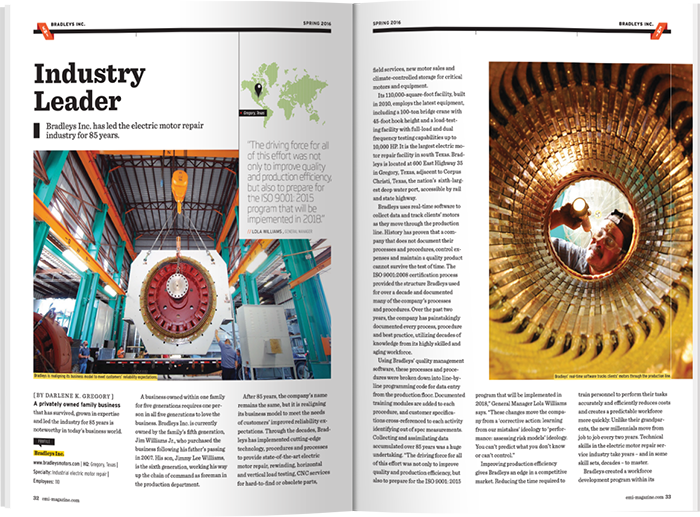 EMW wrote a series of articles of interest to potential clients, and placed them in international publications such as Uptime, Energy & Mining International, Industrial Maintenance & Plant Operations, and more. 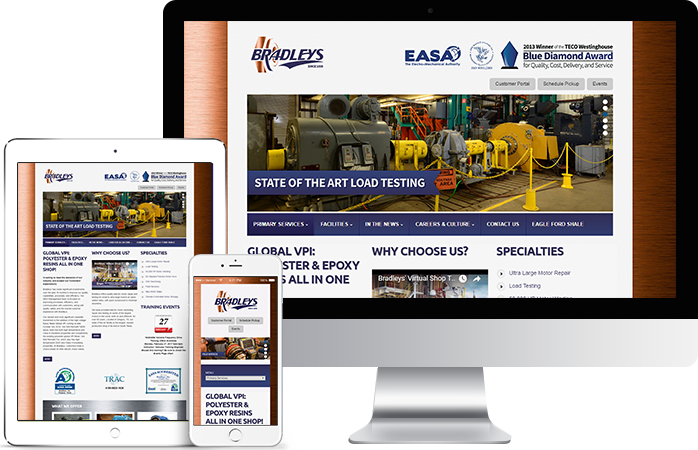 The result: cover features on Bradleys that drove traffic and new business to the company, and worldwide recognition as an industry leader in the repair and testing of large industrial electric motors. 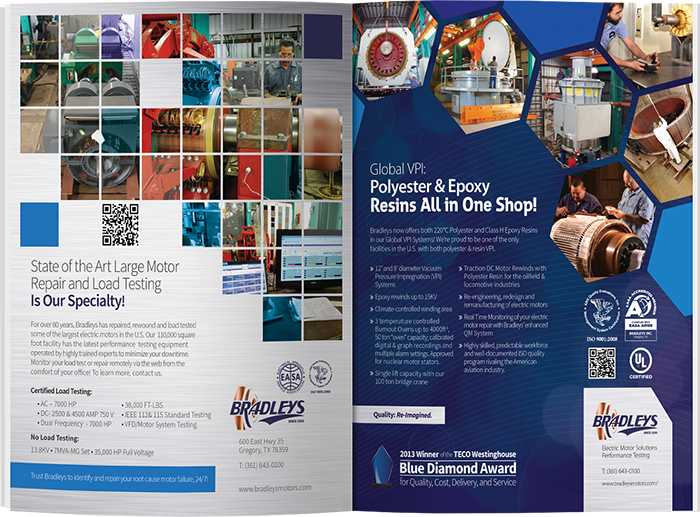 Bradleys is now recognized as a leading authority on electric motor repair and testing in North America.